The Basic Wireless Switch Kit includes one self-powered wireless light switch & one RF receiver. 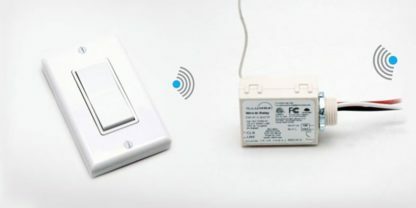 The receiver is simply wired between the power and the light, then stored in the light box behind the fixture. The light switch is programmed to the receiver through a simple single-button configuration procedure. Mount the switch anywhere with industrial tape or screws.